In a parking garage below U.S. Airways Center, what was left of the Phoenix Suns sat on the team bus Thursday. General Manager Ryan McDonough and President of Basketball Operations Lon Babby joined the players and coaches for an impromptu team meeting on the bus, trying to make sense out of what had just happened. Only moments earlier, the team and coaches were waiting for the bus to pull out of the garage and head to the airport for the flight to Minnesota for Friday’s game. But before they could make their escape, their team was irrevocably changed by the NBA trade deadline. The rest of the players could only watch as Goran Dragic, Isaiah Thomas, Tyler Ennis and Miles Plumlee walked off the bus and back into the arena after finding out they were no longer members of the Suns. The prospect of a Dragic trade hung over the team practice Thursday morning, a day after the popular point guard demanded to be moved because he no longer trusted management. So the news shocked few when it was reported by various media outlets that Dragic, along with his brother Zoran, were headed to Miami. The reports said the three-team deal will send Norris Cole and Shawne Williams to New Orleans from the Miami Heat. Phoenix will receive Danny Granger, Justin Hamilton and two first round picks from Miami along with John Salmons from New Orleans. Dragic’s trade was expected but the complete shakeup of the rest of the roster sent shock waves throughout the city and NBA. Multiple reports said Isaiah Thomas was sent to Boston, officially ending the Suns’ three-point guard experiment. Phoenix, according to multiple media outlets, will receive Marcus Thorton and a pick back from the Cavaliers as part of the deal. Plumlee and Ennis are reportedly set to go to Milwaukee, along with Michael Carter-Williams from Philadelphia. The Sixers will receive the pick the Lakers were sending the Suns this season, which is top-five protected. From the Bucks, the Suns will receive Brandon Knight, who will fill the guard void left by the departure of Dragic and Thomas. The end of the three-point guard version of the Suns may have been sudden but the writing was on the wall. Suns guard Eric Bledsoe said after practice earlier Thursday the team chemistry was clearly not at the level it had been a season before. When the Suns return to Phoenix for Monday’s game against the Boston Celtics, they will have a completely different look. 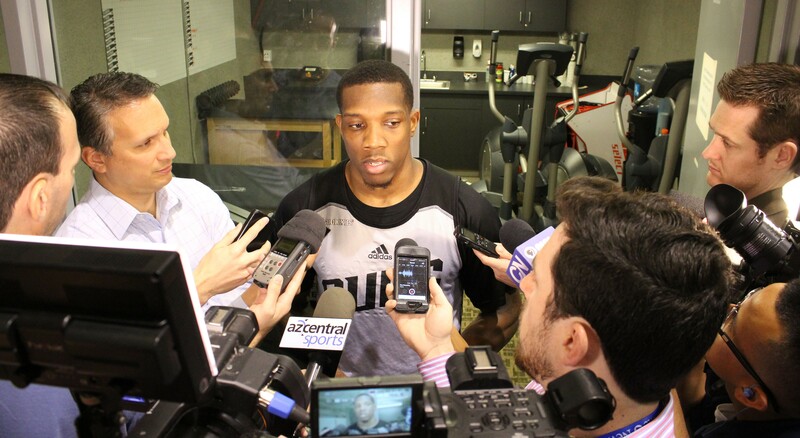 It’s Bledsoe’s team now. Regardless of whether the moves are viewed as a positive or negative, they were a sobering reminder of how quickly a team can change in the modern NBA. Dragic, the closest player the Suns had to the face of the franchise, said goodbye to his teammates before walking back into the arena for the last time. After the team meeting concluded, what was left of the Phoenix Suns headed out into an unknown future. 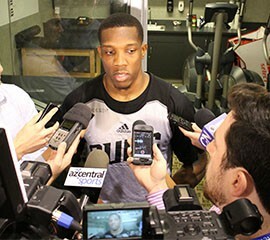 Taking centerstage as the new leader of the Phoenix Suns, point guard Eric Bledsoe is focusing on the team’s continued push for the playoffs.